Abuja — There are strong indications that President Muhammadu Buhari may not receive soon, report of the decisions of Senate and House of Representatives on the approved N30,000 as the accepted minimum wage for the Nigerian workers following the prevailing economic realities of the country as against the N27,000 proposed by the Federal Government. 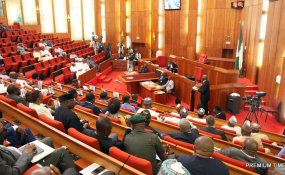 Vanguard gathered, yesterday, that delay in the presentation of the report to the executive by the National Assembly may not be unconnected with the fact that the Senate and the House of Representatives will need to agree on some grey areas. Vanguard further gathered that it had become imperative that both chambers will have a conference to address the issue of difference in the number of clauses. While the Senate dealt with 18 clauses, the House of Representatives addressed 19 clauses, which explains why there must be a conference. Though both chambers had differently approved N30,000 as the new minimum wage for the workers, the difference in the number of clauses would make them have a conference. Against the backdrop that the Senate and the House of Representatives, last week adjourned plenary till April 2, to enable the lawmakers attend to the budget defence process, the minimum wage report will wait till they resume plenary.